MediaTek’s been in the news over the last couple of months partly due to its first of a kind deca cored MT6797 or the Helio X20 SoC. The MT6797 will be coming with 10 cores on board, in big.Medium.LITTLE, adding four additional Cortex A53 cores to theoretically achieve a better balance of performance specifications. Well, the company’s finally lifted the wraps off of the Helio X20, so lets take a look at whether the hype surrounding all these cores coming together is worth its salt or not. While 10 cores on a mobile processor do sound impressive, the real question that comes to mind, particularly given Qualcomm’s Snapdragon 810 issues is that how well will the chip be able to perform over sustained periods of time. All these cores beg the question of whether the MT6797 will be able to consumer power effectively as well. Well, MediaTek’s claiming that the Helio X20 will be able to offer 30% improved power consumption, when compared to a dual cluster design, implying that all these additional cores will actually end up improving power consumption, rather than deterring it. When it comes to the amount of cores on a mobile SoC, MediaTek’s been somewhat of a trend-setter. After its octa-core design, looks like it’s also going to be the first when it comes to a deca core design. 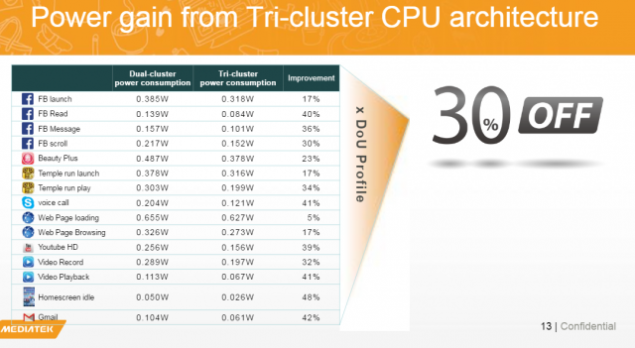 The company also launched its CorePiot 2.0 last week, that combined Heterogeneous Processing for GPU and CPU combined. With its 10 cores on the MT6797, it also intends to maximum power consumption apart from top notch performance. 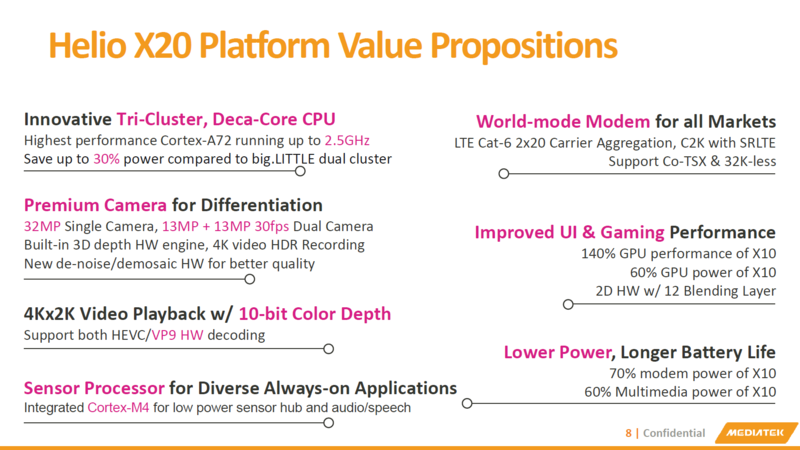 For a company whose main strength has been chipsets for entry level devices, MediaTek’s taking some big strides indeed. As expected, the Helio X20’s tri-cluster design will also be able to adjust clocks and optimize all three clusters for high performance needs. ARM’s Mali GPUs power some of the top chipsets out there. While Qualcomm’s Adreno lineup that come alongside the Snapdragons have maintained an edge over the British company’s designs, its Mali series are nevertheless among the top mobile GPUs out there. 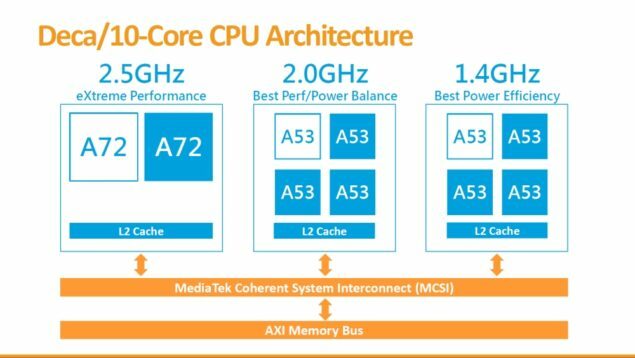 MediaTek’s MT6797 will also be coming with an undisclosed ARM MaliT8xx GPU, that should end up complementing the CPU by the looks of things. ARM doesn’t seem ready to disclose any GPU details for now, but since prototypes of the Helio X20 are expected to surface in third quarter, things should be pretty clear by then. While the hype surrounding the MT6797 might be due to the 10 Cortex A cores on the chip, these won’t be the only cores the chip will be coming with. MediaTek’s also decided to introduce a companion M4 core on the Helio X20. It’ll have direct access to the chip’s DRAM and also comes with 512 KB of SRAM and a frequency of 364 MHz. It should work alongside the primary cores and take care of secondary tasks such as motion processing. The MT6797 will also include support for DDR3 RAM, which MediaTek claims will be enough since the chipset only supports up to QHD. The Helio X20 will also be coming with MediaTek’s first CDMA2000 modem. This means that the MT6797 will now be able to support up to 300 MB/s of download and 50MB/s of upload speeds coupled with 30% reduced power consumption when compared to its predecessor. Looks like MediaTek’s got all of its bases covered while designing the MT6797, and even though the chipset might not be completely be able to match performance specifications offered by other high end chipsets, its a good stepping stone for a larger foundation. Maybe MediaTek should look towards better manufacturing processes and more design refinements. We’ll know more when the MT6797 becomes available for testing and in devices. Stay tuned and let us know what you think in the comments section. 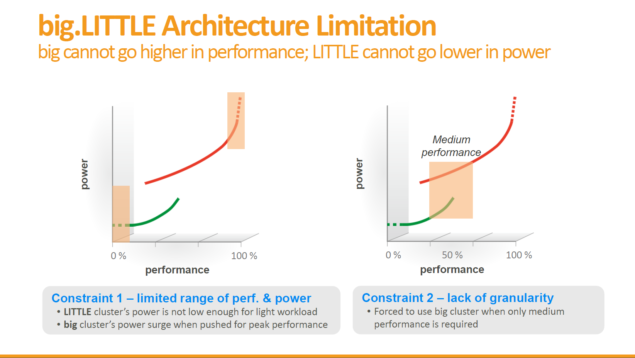 MediaTek Might Supply Apple With LTE Chips Starting From 2018 – Is Qualcomm Being Cut Off?